Even a fraction of an ounce off chips away at your efficiency, profit margin and customer satisfaction. That’s why our valve bag filling machines are specifically designed to handle whatever material you throw in them, from seed and plastic pellets to clays and cement adhesives. An empty bag is placed on the valve bag packer’s fill spout. The fill spout is suspended from an electronic load cell that accurately weighs the amount of product in the bag, whether it’s 10 lb. or 125 lbs. 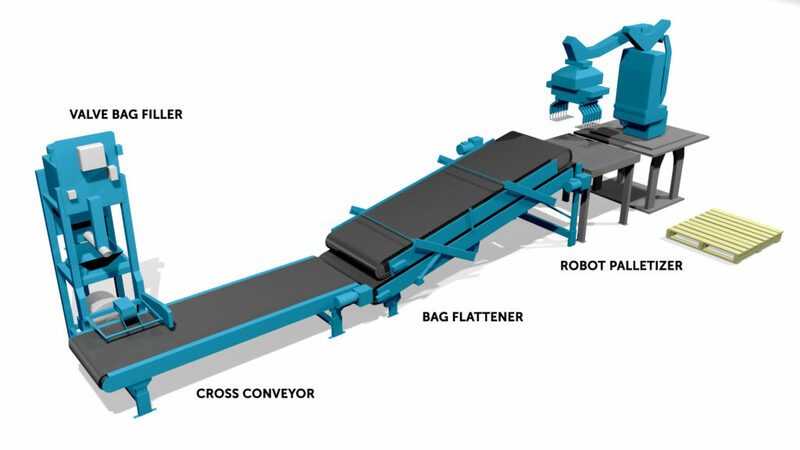 The bag is placed on the fill spout by hand or by a robotic valve bag placer in automated systems. Once the bag is filled, the bagged material pushes the sleeve or valve shut while the bag kicker removes the bag from the filler. The fill spout on the valve bag fillers can be designed with air reliefs that work in conjunction with bag perforations so displaced air can escape the bag during filling. granular material can be packaged with an auger packer. Impeller packer: Uses an impeller or slinger to “sling” the product through the fill spout to the bag. Dense, fine mesh materials such as grout are best packaged on valve bag fillers using impellers. Need to complete your packaging system? Magnum Systems has many years of experience integrating auxiliary packaging equipment to provide you with a reliable packaging solution from bag filling all the way through palletizing. If your bags require a positive seal, it can be hermetically sealed with ultrasonic sealing that uses sound waves instead of heat to fuse the valve together. Ultrasonic sealing can be performed at the spout, thus minimizing dusting in the process.